I think it’s true to say that the world has been made a better place by Matt Groening. He’s been responsible for producing more hours of quality entertainment than anyone else on the planet. 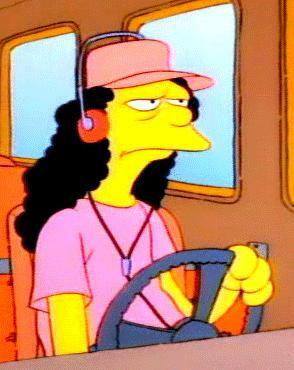 What with it being 5.45 on a Sunday morning, and Alec Baldwin not being here right now, I thought I’d take one minute to champion Otto the bus driver from The Simpsons. He’s probably about my 14th favourite character on The Simpsons, quite a long way down after Comic Store Owner, Selma & Patty, Moe, Principal Skinner’s mum, Ralph, Apu…. gosh, maybe further than 14 but still, I do love the Ottoman. Turns out we have more in common than you’d think: 40 of the Otto man’s favourite things.